To teach well, in my opinion, requires deep knowledge of the content as well as the ability to communicate that knowledge effectively to students. At Pune’s Abasaheb Garware College where I have been since 2008, I currently teach Biodiversity and Systematics course to undergraduates and Environmental Biotechnology, Bioinformatics and Genomics-Proteomics courses to MSc students. Initially it was hard for me to break the stereotype of a teacher that students have in their minds. The process started when I realized that first I have to break the stereotype of a teacher that I had in my mind. Evidently residual from their high school days, students would expect readymade materials from me. It became clear that my goal of inculcating understanding of subject matter in students would not be met, by a long shot, if my students are focused on regurgitating answers in examinations without processing. It took me a while to reach where I am engaging students and fulfilling the learning objectives I set for my classes. Over the years I have developed student-centric approaches of active learning, helping them adapt to understanding by engaging them, and aligning my teaching outcomes with assessments. I wish to share some such manageable approaches, tried and tested in my classes, that also taught me substantially as a teacher. ‘Teacher/blackboard-centric’ classrooms, I think, are counter to a conducive learning environment. There are, of course, genuine practical constraints to changing every classroom. But lack of resources cannot be an excuse if I want to really improve this scenario, I told myself. I started working on how to create a student-centric classroom. Meanwhile, I was aware of Robin Wright, at the University of Minnesota, has changed the way classrooms are designed in many US universities. Scientific studies done on redesigning learning spaces in classrooms have only confirmed their efficacy in improving learning and understanding in students. Meeting Robin Wright during the organisation of ‘National Workshop for Undergraduate Biology Teachers’, profoundly changed the way in which I used to think of a UG/PG classrooms. For starters, I changed the sitting arrangement for students in my class. They sit facing each other rather than me or the backboard. I chose modules from the course that would be appropriate to generate peer discussions and they could perform activities such as generating explanations for key terms, generating hypothesis on a given query, building models to explain given predictions, solving short quizzes and critically evaluating a given conclusion etc. For example, while teaching central ecological concepts such as ‘Habitat’ or ‘Niche’, I ask students to first discuss their own understanding of relevant terms (Habit, Habitat and Niche) and draw few examples from their surroundings to evaluate whether they see the distinction between these. In general, the teaching strategies I opt for depends on what I expect students to take away from that specific topic. For the modules where conceptual understanding is important, I use active learning methods in the classroom; for information based modules (like Biogeography or study of biomolecular databases) I assign small problems that require students to survey original scientific literature for answers. There are modules where visual stimulus is important ( such as protein structure prediction or study of an ecosystem), I teach with live demos or online tools or on-field trips which are supplemented with open discussions. I also use few (powerpoint) slides to reiterate fundamental concepts that students discuss. The first discussions usually take a fair bit of time as students are not normally encouraged to ‘talk among themselves’. Once they start apprehending the importance of such discussions for their own understanding, they become more open and responsive. Peer discussions followed by peer evaluations can then be used to teach various modules from the curriculum. But here one has to take care of the diversity of students that are there in each group, making sure each one of them participates and updates her understanding of the concepts. During class sessions, Formative Assessment tasks are helpful in assessing the levels of understanding, such as Think-pair-share, using Wikipedia or online worksheets where student do things actively which are relevant in the understanding current scientific scenario. I also mentor them via Piazza 24x7 classroom. Such mentoring is especially important when I expect them to come across difficulties in assignments/ tasks but at the same time want them to try to acquaint themselves with the knowledge of current research issues. Using Piazza also helps me manage my time and non academic activities to be performed in my college. 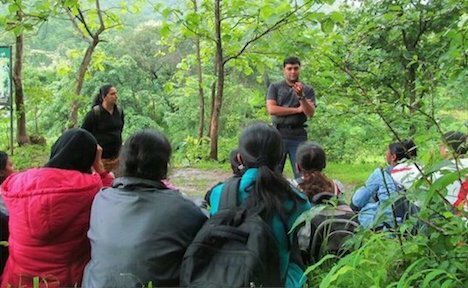 In Biodiversity course I take students out on the field trips to help them ‘see’ what they have learnt. All these activities beyond a classroom also help me get in sync with students. Initially, it was difficult for me to control students who tend to deviate from the main discussion or group assignments but I learnt to identify potential drifters and started giving duties as a group representative or a summary writer that made them focus. 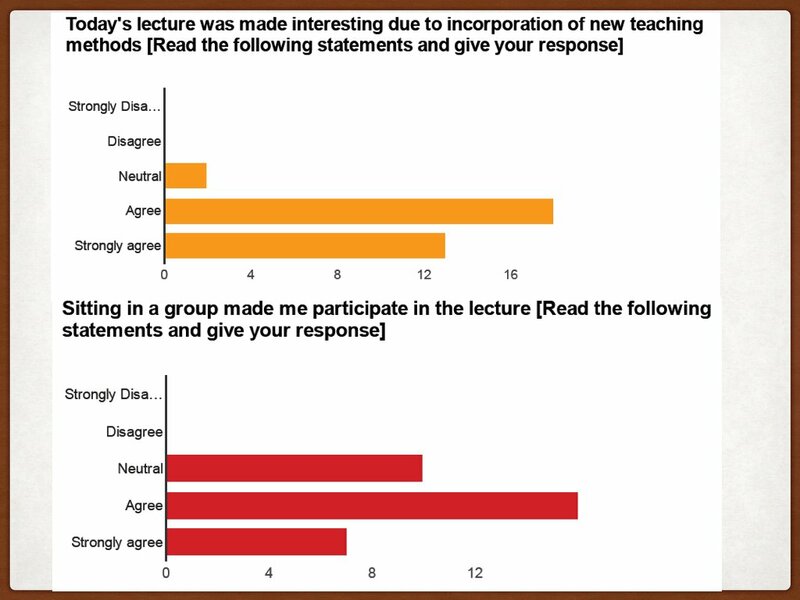 I assessed the effectiveness of this method by surveying the responses of students in comparison with regular classes engaged by me. Below are some of the questions I asked in an anonymous survey (using Google Forms) and students’ responses. To validate the effectiveness of my methods, I correlate their positive responses in the surveys to student scores in the final exams. The data points from such surveys are important feedback, but perhaps more important are non-quantifiable observations made during rearranged classrooms, that gives an idea of where a class is heading. Students otherwise non-responsive start to discuss in class. I was able to identify students that struggle with writing answers but are otherwise good in conceptual understanding. At times, ideas generated during discussions got converted to small exercises or mini-projects. For example, in one of the classes, while discussing factors affecting growth of seedlings, we devised experiments to monitor growth of roots and shoots with respect to direction of gravity. On their own accord, the students designed and executed small experiments at their homes to see what happens if seeds are sown in inverted or in slanting pots etc. Further they included other parameters such as direction of sunlight or type of seed. I also used a soft board for putting up student assignments, sharing co-curricular reading I thought they’d find interesting, and even stress-busting cartoons; which, I found, helps create an environment for students to feel comfortable and focus on their performance. Part II: Blending practical classes to engage students, will feature next week. 1. How People Learn: Brain, Mind, Experience, and School. National Academy Press, Brief Summary & Implications for Teaching, Prepared by: Jose Mestre. How to improve the quality of teaching and research in Indian universities?